Qazvin (; Persian: قزوین‎‎, [ɢæzˈviːn], also Romanized as Qazvīn, Caspin, Qazwin, or Ghazvin) is the largest city and capital of the Province of Qazvin in Iran. Qazvin was an ancient capital in the Safavid dynasty and nowadays is known as the calligraphy capital of Iran. It is famous for its Baghlava, carpet patterns, poets, political newspaper and pahlavi (Middle Persian) influence on its accent. At the 2011 census, its population was 381,598. Located in 150 km (93 mi) northwest of Tehran, in the Qazvin Province, it is at an altitude of about 1,800 m (5,900 ft) above sea level. The climate is cold but dry, due to its position south of the rugged Alborz range called KTS Atabakiya. The city was a capital of the Persian Empire under Safavids in 1548-1598. It is a provincial capital today that has been an important cultural center throughout history. Archeological findings in the Qazvin plain reveal urban agricultural settlements for at least nine millennia. Qazvin geographically connects Tehran, Isfahan, and the Persian Gulf to the Caspian seacoast and Asia Minor, hence its strategic location throughout the ages. The city today known as Qazvin is thought to have been founded by Shapur II, King of Persia in 250 CE, under the name Shad Shahpur (shad can be read as 'happy'), when he built a fortification there to control regional tensions. Qazvin has sometimes been of central importance at major moments of Iranian history. It was captured by invading Arabs (644 AD) and destroyed by Hulagu Khan (13th century). After the Ottoman capture of Tabriz, Shah Tahmasp (1524–1576) made Qazvin the capital of the Safavid empire (founded in 1501 AD), a status that Qazvin retained for half a century until Shah Abbas I moved the capital to Isfahan. In 1210 the city was conquered and sacked by the forces of Kingdom of Georgia sent by Tamar the Great, as per the retribution for destroying Georgian-controlled Ani by the Muslim forces that left 12,000 Christians dead. In the 19th century Qazin flourished as a center of trade because the only all-year accessible road from the Caspian Sea to the Highland started here and with enhanced traffic on the Caspian Sea the trade volume grew. Its bazaars were enlarged. In the middle of the century the Babi movement had one of its centers here and the first massacre of Babis occurred in Qazvin in 1847. In the second half of the 19th century Qazvin was one of the centers of Russian presence in northern Iran. A detachment of the Persian Cossack Brigade under Russian officers was stationed here. From 1893 this was the headquarters of the Russian Company for Road construction in Persia which connected Qazvin by roads to Tehran and Hamadan. The company built a hospital and the St. Nicolas Church. In 1920 Qazvin was used as a base for the British Norperforce. The 1921 Persian coup d'état that led to the rise of the Pahlavi dynasty was launched from Qazvin. It became a state in 1996. In Autumn 2015 portions of Qazvin were struck by a meteorite. The majority of the people of the city of Qazvin are Persians. The majority language is Persian with a Qazvini accent. Azerbaijanis and Tats Persians are the other largest ethnic groups of the city of Qazvin. They speak Azerbaijani and Tati. Qazvin contains several archeological excavations. In the middle of the city lie the ruins of Meimoon Ghal'eh, one of several Sassanid edifices in the area. Qazvin contains several buildings from the Safavid era, dating to the period in which it was capital of Persia. Perhaps the most famous of the surviving edifices is the Chehel sotoun, Qazvin, today a museum in central Qazvin. Masjed Al-nabi (Soltani Mosque): With an area of 14000 m2, this mosque is one of the most glorious mosques of antiquity, built in the Safavieh's monarchy era. Sanjideh Mosque: Another mosque of Qazvin dating back to pre-Islamic Iran; a former fire temple. Its present-day form is attributed to the Seljukian era. Panjeh Ali Mosque: A former place of worship for royal harem members in the Safavid period. Peighambarieh School-Mosque: Founded 1644 according to inscription. Peighambarieh Shrine: Where four Jewish saints who foretold the coming of Christ, are buried. Molla Verdikhani School-Mosque: Founded in 1648. Salehieh Madrasa and Mosque: Founded in 1817 by Mulla Muhammad Salih Baraghani. Sheikhol Islam School-Mosque: Renovated in 1903. Eltefatieh School: Dating back to the Il-Khanid period. Sardar School- Mosque: Made by two brothers Hossein Khan and Hassan Khan Sardar in 1815, as a fulfillment of their promise if they came back victorious from a battle against the Russians. Shazdeh Hosein Shrine (location: 36.257253°N 50.000678°E﻿ / 36.257253; 50.000678); a c.15C CE shrine to a c.9C CE Shiite saint. About 100 km (62 mi) south-west of Qazvin are the tombs of two Saljuki era princes — Abu Saeed Bijar, son of Sa'd, and Abu Mansur Iltai, son of Takin — located in two separate towers known as the Kharraqan twin towers. 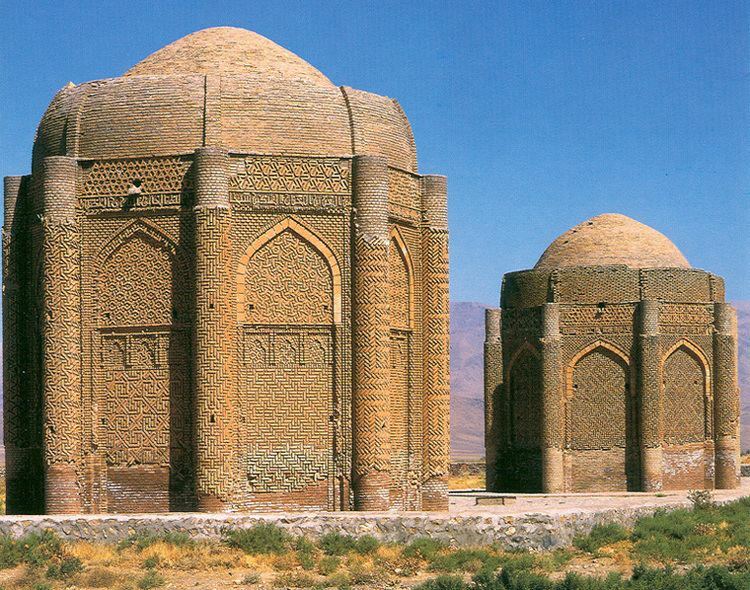 Constructed in 1067 CE, these were the first monuments in Islamic architecture to include a non-conic two-layered dome. Both towers were severely damaged by a devastating earthquake in March 2003. Qazvin has three buildings built by Russians in the late 19th/early 20th century. Among these is the current Mayor's office (former Ballet Hall) and a water reservoir. St. Nicholas church was built in 1904 by the Russian Company for Roads in Persia which had its headquarter here. 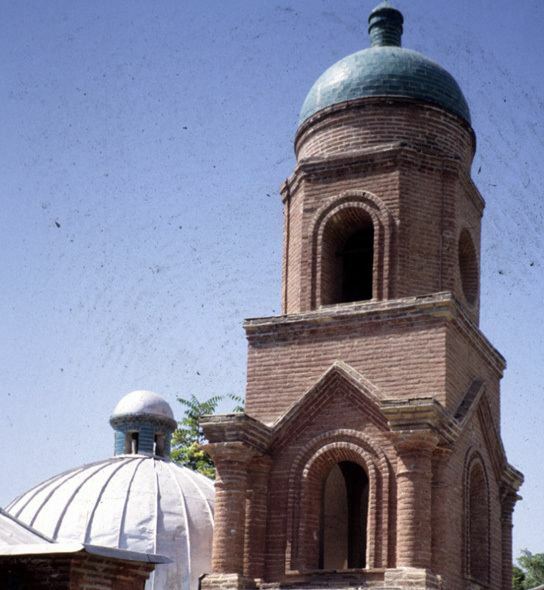 The church was in use until being decommissioned in 1984 because the community of Russian emigres in Qazvin did not exist any more. The iconostasis and bell was removed to Tehran and the building handed over to the Iranian government which keeps it available to the public as a historic monument. In front of the church is a 1906 memorial to a Russian road engineer. Qazvin today is a center of textile trade, including cotton, silk and velvet, in addition to leather. It is on the railroad line and the highway between Tehran and Tabriz. Qazvin has one of the largest power plants feeding electricity into Iran's national power grid, the Shahid Raja'i facility, which provides 7% of Iran's electrical power. Some famous residential towers are: Punak (536 units), Aseman, Elahieh, Bademestan (440 units in 17 floors) and Tejarat tower with 28 floors. Proma Hypermarket (closed) HyperKeper is new Brand . Qazvin is a well-known city because of its famous athletes. The city has highly focused on athletic teams along recent years. Techmash is a basketball team which entered Iranian Basketball Super League in 2013. Ibn Majah, author of the last of the six canonical hadith collections recognized by Sunni Muslims. Hamdollah Mostowfi: the great Il-Khanid historian and writer. Ubayd Zakani: famous 8th-century poet noted for his satire and obscene verses. Yousef Alikhani: contemporary fiction writer and researcher. Azizi family: a well-known family that originates from Qazvin includes |Sheikh Ahmad Azizi]], known research and medical doctor Dr. Sadegh Pirooz Azizi, the former Minister of Foreign Affairs from 1997–2005 Mr. Ahmad Azizi, hadi Azizi and Abolghasem Azizi. Ali Akbar Dehkhoda: prominent linguist and author of Iran's first modern Persian dictionary. Abdul Hossein Darki: known doctor. Jamal Karimi-Rad: former Minister of Justice (2005–2006). Shirin Neshat: Famous contemporary Iranian artist. Mojabi family: a prominent family that originates from Qazvin including Javad Mojabi and Zohreh Mojabi. Molla Khalil Ibn Ghazi Qazvini: famous faqih (religious jurist) and commentator of the Qur'an in the Safavid period (d. 1678). Aref Qazvini: poet, lyricist, and musician. Ra'ees ol-Mojahedin: The late Mirza Hassan Sheikh al-Islam, son of Mirza Masoud Sheikh al-Islam, leader of the liberals and constitutionalists of Qazvin. Shahid Saless: killed in 1846. The third religious leader after Imam Ali who was murdered during prayer. Kázim-i-Samandar: a famous follower of Bahaullah. Monir Shahroudy Farmanfarmaian: Famous contemporary Iranian artist. Táhirih: influential poet and theologian of the Bábí Faith. Nasser Takmil Homayoun: a contemporary historian. Nasser Yeganeh: Chief Justice of the Supreme Court (1975–79). Haj seyed Javadi: politician in early 1980s. Uwais Qarni: a celebrity of early Islam, thought to have been killed here while fighting against an army of Deilamian origin. Ahmad Ghazali: famous Iranian sufi who died in 1126 CE and was buried beside Shahzadeh Hossein. Ali Ibn Shazan: great scholar of the fifth century.